Last time I posted I was 32 weeks pregnant and I was just starting to get my first stretch marks. I honestly cried hysterically when I found them, but decided to put all of my negative emotions aside and tried to focus on the fact that I was soon going to be a mummy. By 39 weeks I had put on 13 kilograms (approx 28pounds), which I was absolutely ok with and a lot of people would tell me that I was carrying small for my gestation (they were all just trying to be nice, I’m sure). I had plenty of stretch marks on the day I gave birth (39+3 weeks) but after my labour and meeting my beautiful daughter, they were the least of my concern. Just to give you a brief run down of my labour- I was registered to give Birth in the ‘Birth Centre’. This area has a natural birth mentality and they don’t offer drugs for pain relief, they instead have a bath for water births and assist you through breathing etc. So my only ‘plan’ was for my labour to be as unassisted as possible. After 5 hours of pushing, my contractions stopped and my baby’s heart rate had increased, she was also stuck sideways and not moving down, so they decided to intervene. Vacuum failed 3 times and I was moved in for an emergency c-sec. By this time however, she had moved too far down, so they decided on the use of forceps even though there was risk of brain damage and facial disfigurement because of her being an in incorrect position for vaginal delivery. She was born at 4:58pm on August 4th 2012 and taken to Special Care for respiratory issues and a Hematoma. Approximately 4 days after giving birth, I had lost the 13 kgs and I was absolutely fine with my post baby body- I was honestly just happy to finally have my baby out of Special Care and be given the all clear by the Pediatricians! 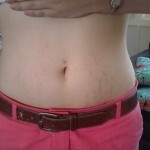 It wasn’t until about 7 or 8 weeks post partum that I realised my stretch marks were getting WORSE. I didn’t think it was possible and thought they were suppose to fade, but each day they were getting higher and redder as my tummy retracted! I was horrified. By 3 1/2 months pp, the stretch marks started to fade slightly on their own and although I was still upset by them, I knew they would continue to get better. At 4 months pp I started applying Strivectin SD cream twice daily, as I had read an article on how great it was for stretch marks and found some on sale discounted by 80%. I have been using this cream now for 3 weeks and I think the results are AMAZING! The marks are definitely still there, but they no longer feel deep and they’ve faded to a silvery white so quickly. If you are worried about your stretch marks, I promise you THEY WILL GET BETTER! To put things into perspective, the most important thing is the beautiful little human you have created is happy and healthy. So as hard as it is, if you are pregnant, don’t focus on what the outside of your tummy looks like, and just enjoy what’s happening on the inside. And once you have your precious little treasure in your arms, spend as much time loving your miracle and loving your body for creating them! 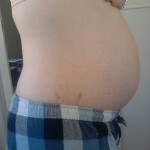 I have my son may 2011 so it going to be almost 2 years. I’m sure many people tell you that you don’t look like you were pregnant.